The operator of the crippled Fukushima Daiichi nuclear power plant revealed Wednesday that melted nuclear fuel has nearly reached the bottom steel wall under the concrete. 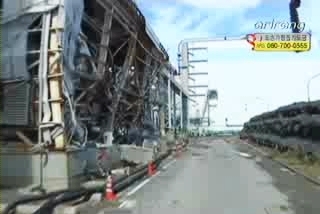 Following the March 11 earthquake and tsunami, all of the fuel inside the No. 1 reactor melted after cooling functions failed with a substantial amount of the fuel melting through the reactor pressure vessel and dripping into the outer container. On Wednesday, Tokyo Electric Power Company, said the melted fuel has eroded the concrete base of the reactor container by up to 65 centimeters. If the erosion expands another 37 centimeters, it would be hitting the steel wall. However, TEPCO's analysis is rough at best because it is a prediction of the current situation inside the reactor based on its temperature change and injection of cooling water. "TEPCO's analysis says we have 30 centimeters of the concrete base left to prevent the melted fuel to hit the bottom. But I am not confident that we have that much space left. We have to be prepared for the worst case scenario." If the fuel melts through the remaining concrete embedment, which is only some 30 centimeters, it is bound to seep into the soil. Therefore, experts say TEPCO must find a measure to prevent fuel leakage. "I think they must install a 5 to 10 meter barrier in the basement to prevent the worst case scenario." Leakage of melted fuel may invite a host of difficult problems such as safe removal of the fuel in a cold shutdown of the nuclear reactor in the future. For that reason, experts stress TEPCO must promptly find a way to put a stop to the fuel erosion inside the reactor.